Positive or Negative what is the impact of Technology in the Early Years! We all understand technology is the way of the future, I know myself I rely on it living abroad whether it is for work or even to speak to family and friends. There are many pros and cons to using technology with children. In this post we are going to look at a little research on technology in schools and parenting. Society is forever changing with more parents working (double income) in order to pay for lifestyle, expenses (education, housing, food) for the average family it can be expensive. In return children can be given more time in front of technology (electronic babysitter) whether it be tablets, smartphones and tv. With everything digitalised it can be hard to prevent your child from using technology as it is all around us. 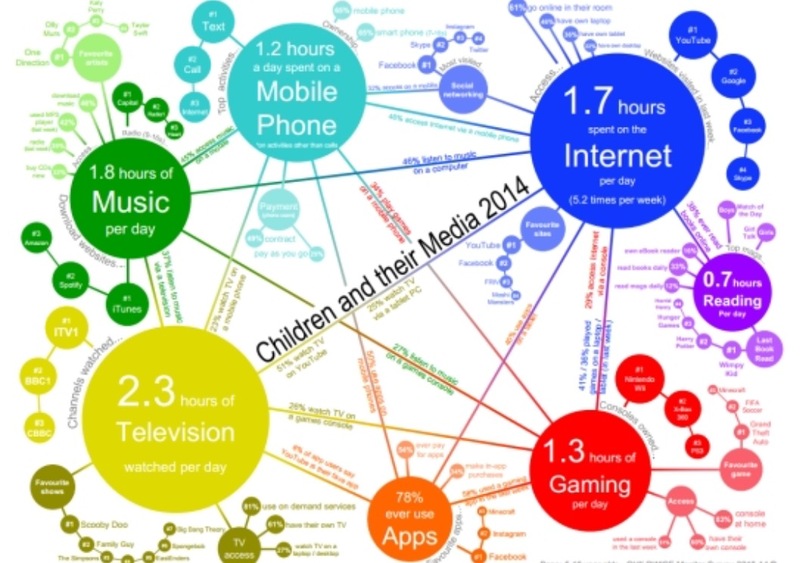 The average usage are shown below for Children and their media in 2014. This may have increased in 2015 with society’s peer pressure, schools having more access to technology and lessons online. My question to you has technology improved our children’s learning? From experience in teaching, lecturing and coaching it can cause issues for children with their fine motor skills, behaviour and social skills. I personally have an extremely physical child (usually referred to as highly spirited) whom loves to run outside and play. However once on the iPad/tablet, when asked to turn it off turns into a little monster (gives me 5 minutes peace) then 1hr of agony after it, negotiating why he had to turn it off, not turning it off and so on. 1. Screen time disrupts sleep and desynchronizes the body clock(link is external). Because light from screen devices mimics daytime, it suppresses melatonin, a sleep signal released by darkness. Many children are “hooked” on electronics, and in fact gaming releases so much dopamine—the “feel-good” chemical—that on a brain scan it looks the same as cocaineuse. Light-at-night from electronics has been linked to depression and even suicide risk in numerous studies. Both acute stress (fight-or-flight) and chronic stress produce changes in brain chemistry and hormones that can increase irritability. 5. Screen time overloads the sensory system(link is external), fractures attention(link is external), and depletes mental reserves. Experts say that what’s often behind explosive and aggressive behavior is poor focus. (link is external)When attention suffers, so does the ability to process one’s internal and external environment, so little demands become big ones. This definitely is true with my experience however I’m sure other children are much more sensible when using technology which I would love to hear about. One thing as parents I know my husband and I are both guilty of is emails, using social media, smartphones too much even at family time. So when I came across this campaign by Gary Turk called ‘Look Up’ Its all about the use of social media in society. He mentions ‘you aren’t going to be dad of the year if you can’t entertain your child with out the iPad’. I became quite emotional, realising how much we can miss. This can be the case for both parents especially if you are working, looking after children, running around to different activities or even just trying to keep up with the Jones. Don’t get me wrong there are many positive uses for technology in everyday use. I also believe there is a place for technology with children learning at school and home. Teachers can deliver lessons through interactive programmes on smart boards, teaching with these mediums would attract a lot of young learners that might find it hard to concentrate at times, keeping the students engaged. However in the early years (foundation stages) there is a need to first develop their senses, foundation skills in maths, reading, fine motor skills, gross motor skills and communication through other means. For e.g reading programmes like read, write, ink or Jolly Phonics. Even maths using physical counters, measuring all the information, utilising natural materials from sand, leaves and mud to the manipulatives provided. Let me know your experience with children and their technology. Next Post Understanding STEM in Early Years!